The Senate will vote on this proposal on Wednesday – but where’s the $20M? The University of Oregon wants to embrace its inner shoe designer and forge a strong link with Portland area sports products companies, including Nike Inc. In the works are two new sports-centric master’s degrees — one in product design and another in the management of product design teams — and a new, UO design laboratory under Portland’s Burnside Bridge. To animate the programs, the UO business and architecture schools are proposing a “cluster hire” of four professors: two in product design, one in marketing strategy and retailing, and one in product development management. The plan hinges on raising about $20 million from donors. The plan’s advocates expressed little doubt that they could raise the money. The cluster of professors would play to the Portland area concentration of athletic and outdoor firms, said Jim Bean, senior associate dean for academic programs at the Lundquist College of Business. AAA and LCB jointly submit a strategic initiative in Sports Products that seeks to educate product designers and design process managers for the state’s largest, homegrown, alpha-cluster of companies, and to conduct research critical to their continued success. This collaboration addresses an academic opportunity, to launch a program which enables two critical components that Oregon owns: one is that of connecting design and hands-on learning with strategic management practices; two propels a model of embodied learning, where action art/athletics/physical health/sports are a rich part of an intellectual and learning continuum. So here’s hoping we’ll get more than “trust us” from the administration before we vote on it. 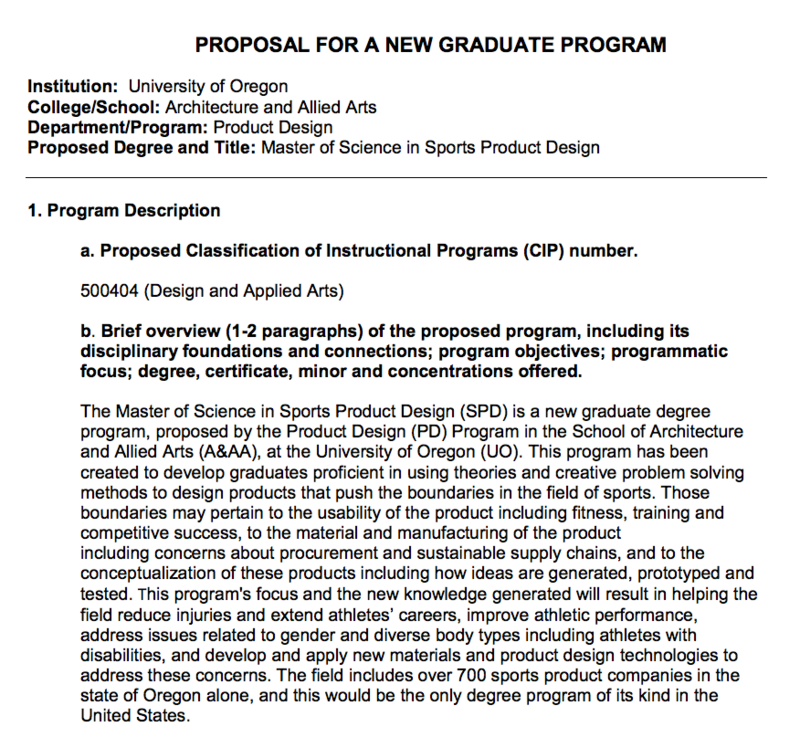 The state Higher Education Coordinating Commission on Thursday approved UO’s application to start a Master of Science in Sports Product Management. The program, long sought by the region’s sports products companies, will enroll students this fall. But before the commission’s 6-2 vote in Salem, PSU President Wim Wiewel delivered a fusillade of criticism at the program. He accused UO of failing to collaborate with PSU on the curriculum and made clear his dissatisfaction with any other state higher education institution infringing on PSU’s turf. “You are deciding if you are going to allow our public universities to engage in a free-for-all for the Portland geographic area,” Wiewel told commissioners in prepared remarks before the vote. UO officials, for their part, were delighted with the board’s vote. They noted that the program has been under formation for about two years, has widespread support from companies such as Nike, Columbia Sportswear and Keen, and is expected to enhance the region’s existing reputation as the epicenter for athletic footwear, sportswear and outdoor products. Off course it’s already a money pit, despite promises donors would pay for it. And it’s sucking up time that UO’s administrators could have spent supporting research that might help keep us in the AAU. And it’s cost UO maybe $500K in Jim Bean. That said, it’s a natural for UO. The Communication and Emergency Response Center (CERC) serves the UO community by providing dispatch and emergency communication services for UOPD, Parking and Transportation, Environmental Health and Safety, Student Affairs and Campus Operations, serving a population of approximately 30,000. UOPD maintains its own communications and records units, and works closely with the City of Eugene Police Department (EPD). The current CAD system was installed in 1997 and no longer interfaces with the City of Eugene PD system. 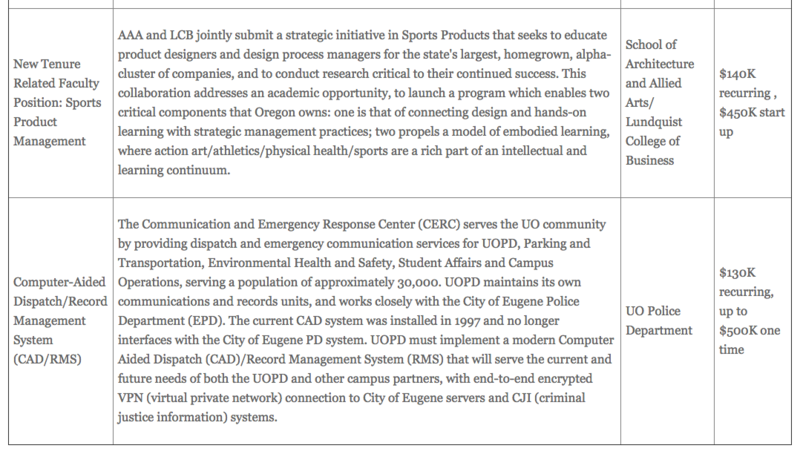 UOPD must implement a modern Computer Aided Dispatch (CAD)/Record Management System (RMS) that will serve the current and future needs of both the UOPD and other campus partners, with end-to-end encrypted VPN (virtual private network) connection to City of Eugene servers and CJI (criminal justice information) systems. 2/24/2015: Coltrane tops off the bloated UOPD budget – up $1M in a few years – with a new Assistant Chief to help out UOPD Chief Carolyn McDermed. She gets $139K a year – same as the chief of Eugene’s far larger EPD. The Chief of the Oregon State Police gets $149K. Job ad here, more bloat below. 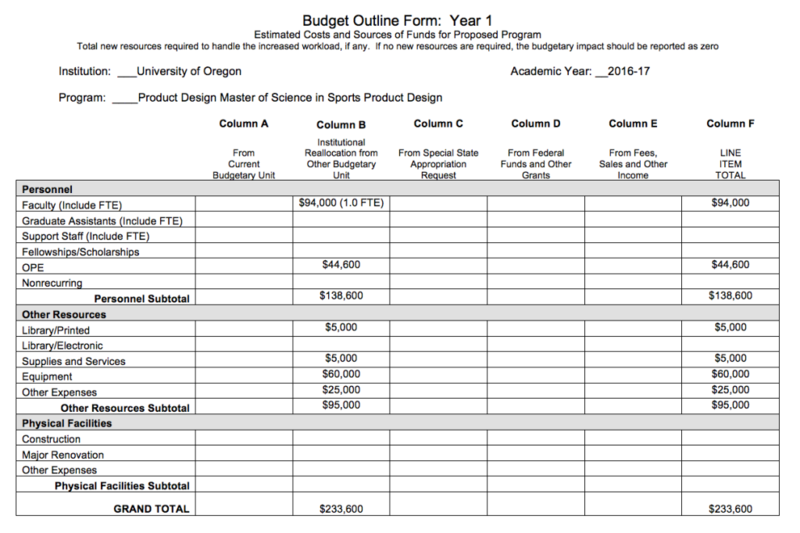 UO to start sports apparel management program? The University of Oregon is exploring the creation of a sporting goods product-management program at its Portland campus, addressing what officials believe is a glaring need for the footwear and apparel-dominated local industry. Ellen Schmidt-Devlin, who worked for nearly three decades at Nike and has been an adjunct instructor of sports business the past three years at UO’s Warsaw Sports Marketing Center, has been leading the effort to assess demand in Portland. Seems like a natural for University of Nike Oregon, and perhaps a use for the White Stag building, the lease for which runs about $2.4M a year. This will have to go through the UO Senate CoC and Undergraduate Council for approval. Here’s hoping they ask some tough questions about the cost. Rumor has it that Jim Bean is working on this, which won’t be cheap.